For 32 years, she has been breathing through her mouth. From the age of 19 when her husband cut her nose with a shaving razor, Allah Rakhi wore a two-by-two-inch bandage around it, just like a pirate who wears a patch around his damaged eye. “I never imagined something so heinous could ever happen to me. I never thought he would ever hurt me so badly,” said Allah Rakhi, who now looks everyone in the eyes as she passes by people in the streets and no longer covers her face with a shawl. Feeling her ribcage on the right, the 51-year old simpleton explained how her surgeon took a tiny piece of her rib and some skin from her forehead to make her a new nose – that is almost as good as if she had never lost it. She does, however, need one or two more surgeries so that doctors can refine it. “It’s a miracle,” said Allah Rakhi, her eyes filling up with tears. Married off as young as 13 in 1974 and with a little boy and a girl six years later, her husband used to beat her black and blue, she said bowing to show a scar in the centre of her head where he had given her 18 stitches. the street, held me down to the ground, cut my nose and slashed my right ankle that he almost severed. “For six years I could not walk without a stick,” she said explaining how in the beginning she used to hide her face from her own son who was then only knee high. Even then she wanted to return home because the thought of being away from her children hurt her more. Her husband was out of the jail after six months. A year after when he knew he was off the hook, Allah Rakhi was divorced. A bus driver married her with whom she lived for many happy years and saw her two children married off. She lost him to a road accident eight years ago. Three years ago, Acid Survivors Foundation (ASF) that usually helps burn victims took her in as special case. In-charge of nursing care and rehabilitation unit, Balqees Shehzad has been by her side since then. But later some top plastic surgeons of the country declined to operate her because they were either unwilling to do charity work or feared contracting Hepatitis C that she had. “But then she met Dr Hamid Hassan who is a Burn and Reconstructive Surgeon at the Benazir Bhutto Hospital Rawalpindi. He put Allah Rakhi on top of his patients’ waiting list and went on with operating her. After two surgeries (one in March and the other in April this year), the second one lasting seven hours, Allah Rakhi could look in the mirror without feeling bad,” said Balqees Shehzad. “This was not the first time such a case had come to us. But she certainly was one of the worst victims with cut noses. There was nothing in place of her nose and she was also a Hepatitis C patient. 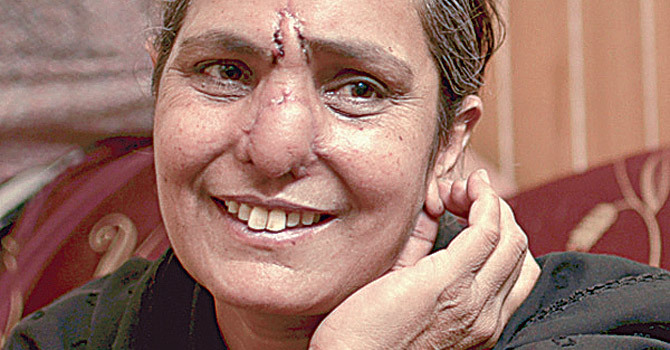 “We will refine the nose further as soon as she is ready for the next operation,” said Dr Hamid Hassan who has been affiliated with the ASF since 2007 and has conducted (with his team) 340 surgeries on burn victims besides arranging camps for such patients every year – all without charging a single penny. Allah Rakhi is one of the innumerable victims of this centuries-old brutal practice against the women of lower socio-economic strata in the region. Allah Rakhi’s son, now in his mid 30s with children of his own, took her back home in Gujranwala where she takes joy to see her grandchildren run around.